While working on the previous post detailing the fine art of the mustard plaster and handling the linen cloth, I was again reminded of all of the healing aspects of the flax plant. I mentioned my fancy of well loved linen, so it may be no secret that I am quite fond of most textiles. Natural fibers, of course, but particularly those whose history I can trace from living plant or grazing creature to finished product. Add in a few good human hands to help harvest, sheer, weave, knit or stitch along the way and I'm all aglow. What was once a basic and necessary commodity for all lingers now as a timeless art for a few who pursue and are deeply gratified by the process. You know who you are! I brushed the cyber-dust off of this article originally written and published in the Winter 2008 issue of the Hollerbeier Haven newsletter. Flax (Linum usitatissi mum) was formerly one of the most useful and productive crops of the Pennsylvania countryside, but its' presence as such, has sadly dissolved into history. Flax was one of the state's earliest agricultural exported items (mustard seed being the other) but cultivation in Pennsylvania ceased almost entirely by 1870, having been in gradual decline since the civil war. The introduction of cheaper cotton goods were also introduced about the same time. Flax seed was sown early in the spring and by early summer the field was awash with a sea of brilliant blue flowers on long slender stalks that swayed easily in the breeze. By the time it was harvested late in the summer, the plants were in seed and ready to be pulled up by hand. They were then stacked on the ground to be rained upon or soaked in a nearby stream to hasten the decomposition of the outer layer of the stalk. This 'retting' process would dissolve the natural glue which binds the flax fibers to the stalk. After the outer skin had rotted, the flax stalks had to be dried again. Depending on the weather this may have happened out in the fields or possibly near a fire. A series of repetitive processes followed that involved 'breaking' the outer stalk and separating the long fibers for spinning. Up until this point all the diligent physical preparations that accompanied planting and harvest were the mainly the responsibility of the men folk. The finished raw flax fibers were then carefully stored in a dry place until they were brought out again during the long dark nights brought in the waning of the year. Spinning was a winter chore performed by the women and girls of the household. An old proverb in the Pennsylvania German dialect was: "Lichtmess, schpinna fergess" which meant that all the winter spinning needed to be completed and the spools full of flax thread by Candlemas/Lichtmass day which was February 2nd. When the spinning was completed, the thread was then sent to the local weaver who produced the linen cloth. The weaver was most often a man, who would likely keep a portion of the cloth as payment for his services. It was rare for an 18th century household to have their own full-sized loom. These were very large and expensive pieces of equipment and were generally owned and operated by those who were weavers by trade. Many households did have a small table or hand loom that could produce a long narrow measure of cloth that was useful for smaller household needs. The total production time from stomping the seed into the cold wet soil to completion of a soft warm undergarment could take up to eighteen months or more. The history of "Flaxbaue' (or flax culture) dates back to the late stone age. Archeological excavations around earthen dwellings in Switzerland show that the inhabitants there were familiar with linen. Through the ages, linen was used not only to fashion garments, but also to make sailcloth for great ships, rope and cording, nets for hunting and fishing, wicks for lamps, as well as for making pages for books and manuscripts. Linen was so revered that is was used as actual currency in some northern regions. Though the blue flax flowers were often associated with the Virgin Mary during medieval times, this was surely a hold over from earlier cultures who understood the flax 'creation stories' to be linked with the various 'spinning goddesses'. The goddesses ( Holle, Hulda,Frigg, Brigit,Perchta, and the Wyrd Sisters) were charged with the gifting of the flax seeds to mortals, the protection and fertility of the flax crop and women, the teaching of spinning and weaving and finally, the spinning of threads of fate or creation and destruction. Spinning the thread could be compared to stirring the soup pot. Starting with seemingly nothing and creating something of great worth and usefulness to the folk. The spinning work contained all of the symbolism of the creation cycle: the beginning creative spark, the living, active work and then the 'harvest', completion or fulfillment of the worthy task. With the death of the plant, came the birth of the seeds for the next years' planting and the beginning of a new cycle. It was these deeply held beliefs that insured that all phases of the flax culture were honored equally and thus were rich with tradition and ritual. Most ritual practices took place during the flax growing season to assure that the plants grew as tall as possible; for the longest lengths of raw fiber made for a stronger thread which was then woven into cloth that was longer lasting. The rituals which focused directly on the fertility and productive health of the fields fell naturally on the women of the village; From the manner in which flax seeds were sown, to the frequent visits to the flax fields during the growing season, the women were solely responsible for these rituals.Later, during the act of spinning, a woman would soon discover that listening to the rhythmic hum of the wheel and watching it circle round and around in front of the open fire, could induce altered states of consciousness. This was (and is) a perfect meditative exercise for the long dark nights of winter when contemplative thought and dreaming the future was all considered to be part of the 'woman's winter work'. Because the flax plant was considered to be overseen by so many beneficial goddesses, it was also a commonly held belief that the blue blossoms, the seeds and the fine linen cloth were strong deterrents to evil sorcery and witchcraft. These parts of the plant were routinely used in healing and protection ceremonies throughout the Middle Ages. A healing plant poultice was made that much more powerful by utilizing linen in the dressing. Many healing women also had special headdresses made of linen and wore them as a defense against demons. In fairly recent times, the healthful benefits of flax seeds and flax seed oil have become common knowledge. The Omega 3 fatty acids in the flax seed oil help to 'ward off' the evils of heart disease and cancer and will reduce inflammation within the body, the source of many ills of today. The seeds (made into a 'slimy' tea by combining 1 cup of boiling water and 3 tsp of seeds) have demulcent and emollient abilities that will soothe coughs and sore throats, or help ease dry constipation and urinary or digestive system inflammation. Flax seed that has been cooked in milk or water and then used as a poultice will have a drawing effect: For bronchitis, pneumonia or asthma use as a chest plaster with mustard powder or combined with grated carrot and or marshmallow root for swellings or inflammation. A warm flax seed poultice will also draw a boil or abscess to a head. Some may think of flax today as a 'new age' or ' natural' remedy but in understanding the incredible significance of the existence of flax in cultures worldwide for the past 25,000 years, the historic uses can be safely utilized and appreciated by families and practitioners yet today. Certainly makes this writer wistfully imagine a large waving blue patch out back. When my own seeds arrive, I will certainly enjoy starting a new 'tossing and stomping' planting ritual of my own! I have to admit...had I not experienced this simple treatment myself years ago (with staggering success) I may have ignored the time worn method with some scoff and skepticism. But witness it, I did: An old time mustard plaster artfully applied to my son by a sweet visiting nurse when he was just a wee lad. He was sick with pneumonia and starting a second round of antibiotics. Me? I was sick with worry and exhaustion after his three week stint of coughing around the clock. I was so grateful for the offer of help and welcomed the opportunity to learn anything that I could do that might help him. I had followed all of the orders prescribed by the doc, which honestly didn't seem to be helping very much. The threat of potential hospitalization loomed and only added to my helplessness. It was a relatively simple procedure in the scheme of things, but the nurse's quiet confidence and gentle care of us both, not only helped my son to turn the corner on his healing, but instilled new confidence in my ability to 'do something' useful for my sick child. In honor of that turning point so many years ago, I thought I'd share the procedure, step by step, the way I was taught. A mustard plaster will bring nearly immediate relief and warmth to a respiratory system plagued by long lingering coughs, congestion, bronchitis or cold damp pneumonia. It works mainly by increasing circulation and introducing deep heat to congested lungs, thus stimulating the loosening and expectoration of mucus. *A length of linen or muslin 24 inches wide by 36-48" long. Lovely well-loved old linens are relatively easy to come by at thrift shops and yard sales and are my plaster fabric of choice. The pieces are often stained or frayed at the edges but I still see a beauty and usefulness there that collectors glance over. The linen can be washed out and used again and again. *An extra towel to layer on top of the plaster once it has been applied to the body will help to keep the warmth in. *If you are so inclined, plastic wrap offers some modern convenience to the process, but is not necessary. A layer of plastic wrap on top of the plaster and wrapped completely around the body will hold it nicely in place. *Large safety pins can also be helpful especially if the plaster cloth is long enough to wrap around the torso to overlap and pin in back. Other wise, folding a towel in half length wise and wrapped around the body on top of the plaster will keep it warm and in place. *Water to activate the' heat' in the powdered mustard seed and to bind it with the flour to make a nice spreadable 'schmutz'. * Lay a folded towel or table cloth out across a table to protect the table. On top of that spread open your linen fabric. You can see that mine has been folded into a trifold and the fold lines are important to the assembly process. *Next, mix together the 1/2 cup mustard powder and the 2 cups of flour until well blended. Take half of the dry mix away for the next plaster treatment. Store in a glass jar with tight lid. Set aside. With the remaining half, blend with little additions of water until the mixture resembles thick paste. (See photo) It cannot be too dry or too runny. You want it to retain a spreadable consistency. ~ Spread the mixture out thoroughly over the center part of the trifold, judging how much you will need to cover either the chest or the back. Doing both is a good idea. Remember that often the underarm area can be pretty sensitive, too, so don't spread the paste the whole length of the cloth. I've found that a person will tolerate pink tingling skin a bit longer when their sensitive spots aren't screaming to be unbound from the cloth! ~Next you'll need to put some very warm water in a basin. In this water, the rolled up plaster will be submerged into the water until the water becomes cloudy. You will likely get a good strong whiff of volatile oils that are activated by the water, smelling a bit like horseradish. Once the plaster has been activated, squeeze out the excess water and be ready to quickly unroll and apply to the body. Afterthought Note**Before preparing the plaster itself, it's important to have the person receiving the treatment ready, reclining and warm with blankets covering waist to toes. They will need to remove upper body clothing at the very last moment. No need to invite a chill. An old sheet or towel should be placed over the pillows to protect from any potential splash and a quilt or blanket close by to throw over the shoulders for warmth. Perhaps, if modesty is a real concern, an extra sheet can be used to drape the entire upper body during the treatment. ~Next, unroll the plaster so that the single layer of cloth (with the mustard layer next) is facing the chest. Center the mustard plaster on the chest and wrap the sides under the arms. Pin in back if possible or use a dry towel topper pinned in front. This same process can be applied to the whole back above the waist...after all, the lungs are situated there, too. ~Leave the plaster in place for 10-30 minutes at the most. This procedure is likely to promote perspiration and reddening of the skin so you will need to be vigilant at checking underneath the plaster edges to assess the condition of the skin every five minutes or so....particularly if you are applying to a child's skin. You want to see nicely pink....not blazing red skin! If a person experiences discomfort, promptly remove the plaster and wash the area with warm soap and water. There are vast variations in skin sensitivity and in the potency of different mustard seeds. Every treatment may be different. Commit to stay close by for the entire treatment...beginning to end. Offer plenty of liquids to the receiving person before and during the plaster. It is important part of the treatment. When the plaster is removed encourage a warm soapy shower to remove any lingering mustard oils as they will continue to irritate the skin. Afterwards, bundle up your charge and allow them to rest for a minimum of 30 minutes. This procedure can be repeated up to two times per day while increasing fluids. It is likely that expectoration will occur with greater ease. I like to show others how to do this in 'real' time ...it was a bit of a challenge with photos. If there are any parts that need deeper clarification, please don't hesitate to ask. From the mildest yellow seed (Brassica alba) to the more pungent, respectively: brown(Brassica juncea) and black seed (Brassica nigra), mustards are one of worlds oldest known spices carried and cultivated by the human race. The seeds are known to have been cultivated in India as far back as 3000 BC and in Egypt, mustard seeds have been found in the tombs of the ancient pharaohs. The paste of ground mustard seeds blended with liquid or oil is the oldest condiment known, although no one knows for sure who first used it to flavor food. Prepared mustard dates back at very least to the Romans, who ground the seeds and mixed them with wine to create their own pungent paste. The spicy seed was then carried and spread throughout Europe via their conquering legions. In some cultures the condiment utilized unfermented grape juice, called must (from the Latin mustum ardens) which lead the condiment to become known as mustard meaning roughly: "burning wine". The potent pastes were slathered on meats to bring fire to the digestive organs, to help break down the fatty protein and likely helped disguise the flavor of meat that may have been well past its prime. The volatile oils in mustard also exhibit antiseptic activity (due to strong sulphur compounds) which may have provided a pungent layer of protection on the surface of spoiling flesh and perhaps saved many a soul from a long miserable night of digestive distress. Sauer’s Mustard Sauce Recipe “…a very good mustard sauce may be prepared in the following manner: Take vinegar and put it in a glass bottle with enough ground mustard to make it thick. Add a little sugar and let it stand for twenty four hours. It is then ready for eating. If the bottle is kept well corked, this mustard will keep well for many weeks, especially during cool weather…” To the right is a photo of my own homemade mustard and a link back to the original post and recipe that includes fresh garlic mustard leaves as well as yellow and brown mustard seeds. The medicinal virtues of black and brown mustard seeds are classified as hot and drying. However these virtues are only released in their full potential when the coating of the seed has been bruised and exposed to a liquid. Interestingly, on this continent, mustard seed along with flax seed were two of the earliest and most prolific export crops grown in colonial Pennsylvania. Not only did the influx of Germans and English demand suitable stimulating digestive condiments to serve alongside their own fatty meats, they also relied heavily on the tiny seeds for their powerful medicinal qualities. Don't be mislead by it's tiny size, freshly ground mustard seed packs a whallop. The ability to stimulate circulation is also evident as a topical treatment for cold or stagnant conditions such as damp pneumonia or cold stiff muscles or joints. A warming mustard plaster, liniment or oil will increases blood flow to the area by 'drawing up the flesh and turning it red'. A goodly snort of crushed seeds will produce a head clearing sneeze. A deep massage with mustard infused oil will warm and release all but the most resistant contracted muscles. Along with culinary and medicinal uses, a few interesting folk uses of mustard seeds linger in cultures around the world: In Germany, new brides still sew mustard seeds into the hems of their wedding dresses to insure that their husbands don't dominate them in their life together. In Denmark and India, it is believed that spreading mustard seeds around the exterior of the home will keep out evil spirits. The ancient Chinese considered mustard a stimulating aphrodisiac. Currently, black mustard seeds are 'losing heat' in the commercial market. The brown seeds are easier to harvest with machines, thus reducing the economic expense of harvesting by hand. The majority of mustard seeds grown for world consumption are cultivated by Canada, Montana and North Dakota. However our wild native Crucifeara family members include Garlic Mustard (Alliaria officinalis) and Penny Cress (Thlapsi arvense) can be collected and also used accordingly. However harvesting the seeds can be a long and arduous process. Looks like I'll be spending the day in the kitchen. I've been trying to plan meals to include food choices grown, grazed or produced within a fifteen mile radius of home. It's rather easy being surrounded by great farmer's markets and farms, not to mention the abundant selections available right out the back door. The baskets, counter tops and fridge have been full of great local food! Yesterday's partial harvest from the garden is seen above (with a basket full of fresh dug potatoes, herbs and a 5 gallon bucket of raw honey that came later in the day) The basket above was dubbed 'Gazpacho to Go' ...and go, it went, directly into the food processor to be blended into a yummy cold soup for lunch for the next few days. Tomato soup, hot or cold, is a comfort food that is always at the top of my fave list. Add a grilled cheese on sourdough, and I couldn't be a more 'comforted' camper. This recipe is more of a ingredient list, because it will vary with whatever is available and abundant: First and foremost, though: Lots of ripe tomatoes. I probably used a dozen or 15 of various sizes and colors. Quarter and put in the food processor bowl and pulse until good and juicy with small chunks. Empty tomatoes into a soup pot. Next, cut the ends off two medium cucumbers and a medium zucchini, half lengthwise and scrape seeds out (if they're large). Quarter and put in the food processor. Pulse until smooth and add to the tomato mixture. Repeat this process with a large onion, 3-4 garlic cloves, 1-2 jalapeno peppers (seeds removed), LOTS of fresh herbs: cilantro, chives, rosemary, parsley, basil, bee balm or oregano, salt and pepper, and a splash of olive oil. Pulse all until nearly smooth and add to the soup pot. If you have it, add two leftover ears of roasted corn, kernels cut from the cob and stirred into the pot. One final addition is not locally grown but, in my opinion, absolutely essential to the recipe: one organic lime, juiced and zested. Another tasty (non-local) addition is a cubed avocado. Stir well, taste for seasoning and chill through! A dollop of plain yogurt or sour cream on top is a yummy garnish. Dinner: All local....the veggies, flowers and pesto from the garden. The chicken, corn and yes, even the mushrooms are local from the farmer's market. I made the pesto with local goat feta.I may never use parmesan again! It keeps the pesto from turning black. oh yes, it was Heaven on a plate. A healthy new arrival was delivered from the garden early this morning!! What a surprise! I was definitely not expecting this baby, but it will be happily welcomed into the family meal plan for the next week or so...maybe even shared with the neighborhood. The sibling in the center is the average size zuke I have been harvesting for the last few weeks. The baby on the left had to be harvested at the same time as it's huge twin. The little baby one was growing directly on top of it and they were connected at the neck! I still am amazed that I didn't see this coming!! Blessings come in all shapes and sizes and this one is definitely a keeper! I recently ordered a new batch of business cards and mailing labels from 'Company XYZ' (name changed to protect my *ss) Their marketing and signage page caught my eye and in no time, I had uploaded a nice design using my own photo images for a market banner to use at shows, etc. The price was extremely reasonable. The banner looked lovely on the preview page and I kept getting what seemed to be personalized pop up boxes suggesting that I had uploaded a "NICE DESIGN!" with "GREAT PHOTO RESOLUTION!". After I jumped through all of their specification hoops, I was given another chance to use this same image on a T-shirt, mug or tote bag. I ordered one T-shirt. I waited two weeks for the banner and the shirt. They finally came today and I was thrilled by the quality of the Tshirt and the reproduction of images. Really sweet. When I unrolled the banner I saw the same great quality on the photos and font, until I saw the entire text line. Now look at this closely...what do you get when you overlap FARM & AT?? yeah....This sign isn't get me more than alotta big laughs from my customers !! I spent most of the afternoon trying to get this squared away with their customer service department. Bottom line...sneaky bottom line, though it is....it is my fault. My loss. I'll spare you all the boring details here but Dang it!I was so mad trying to understand how the Tshirt is fine and the banner is trash. However, every single time I look at that crazy text, I laugh again. Costly humor, that banner!! This is a repost from last summer. 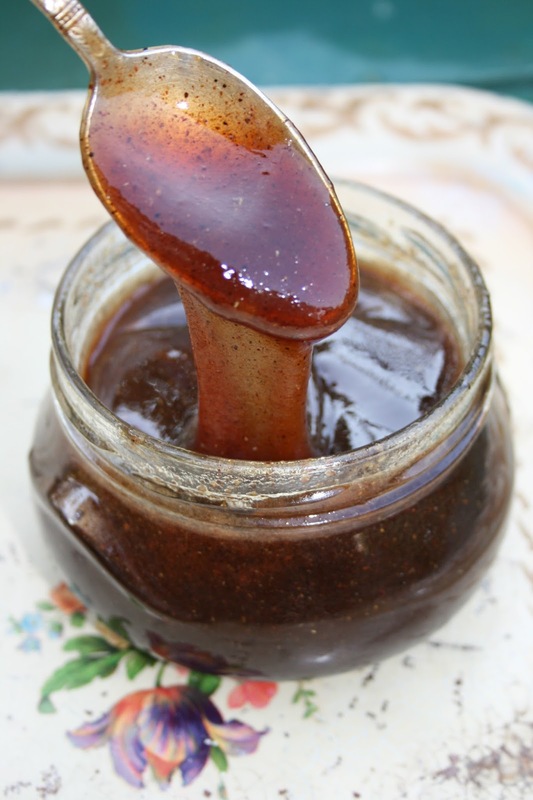 The simple syrup recipe remains the same but the pleasure is always new again! We thoroughly enjoyed the elderflower syrup this past weekend in the "Homestead Herbalism, Too" class and also made lemon verbena and lavender blossom syrups as well. There are a limited amount of freshly bottled syrups available for purchase, if you are interested. They are listed in the seasonal offerings section of the website. A single tablespoon of syrup over a tall glass of cracked ice and water is such a lovely refreshing treat on a hot day. Add sliced lemons or limes, if you prefer! A spoonful of the lavender syrup is amazing in a hot cup of chamomile tea. Try one or all three...The sky is the limit with the creations you can concoct! Enjoy...we sure did! One of the most pleasant ways to prepare and take herbs is in an electuary, which is a fancy-pants name for a sweet herbal paste or jam. In times past, many bitter-tasting and downright unpalatable herbs were likely prepared in this way to 'help the medicine go down". In its simplest form, an electuary consists of honey and powdered herbs; however, I've seen a variety of interesting additions in recipes: fragrant flowers (fresh rose petals come to mind), wine, brandy, herbal vinegar or medicinal tinctures; fruit or herb syrups, jams or conserves. The gamut of possible combinations in recipes of electuaries can run from the very simple to the extremely complex. The great Greco-Roman physician Galen's Theriac electuary had over 64 different ingredients! Well made, electuaries will keep for a very long time. Many actually mellow and improve with age. Precious pots of herb and honey blends have been found intact in the burial tombs of many of the great pharaohs of Egypt. Apparently they were considered a valuable necessity to have in the afterlife! 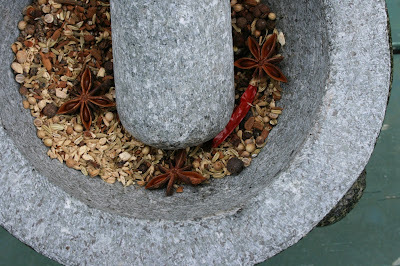 My favorite combination for an electuary is an assortment of warming carminitive and aromatic spices. This particular blend is particularly useful in the event of digestive cramping, nausea, intestinal gas, diarrhea and other uncomfortable disorders of the digestive system. Many of these same spices are also strongly antibacterial in the case of digestive upset caused by ingesting microbial nasties. Some may be surprised, if not skeptical, of the potent medicinal power of these common kitchen cupboard spices. If the medicinal value of this tasty electuary hasn't sold you yet, make this simply to stir into a cup of hot water or hot black tea and cream for an instant chai tea! And please, don't forget to try the buttered toast. It's heavenly. Here is my own recipe for this excellent electuary. Be sure to use whole spices to start. Commercially powdered spices may have already lost a good part of their 'zing' and with it, a good part of their medicinal value. Preheat oven to 350 degrees. Place whole spices into a pie tin and roast in the oven for about 5 minutes or until the spices are fragrant. Remove and cool. 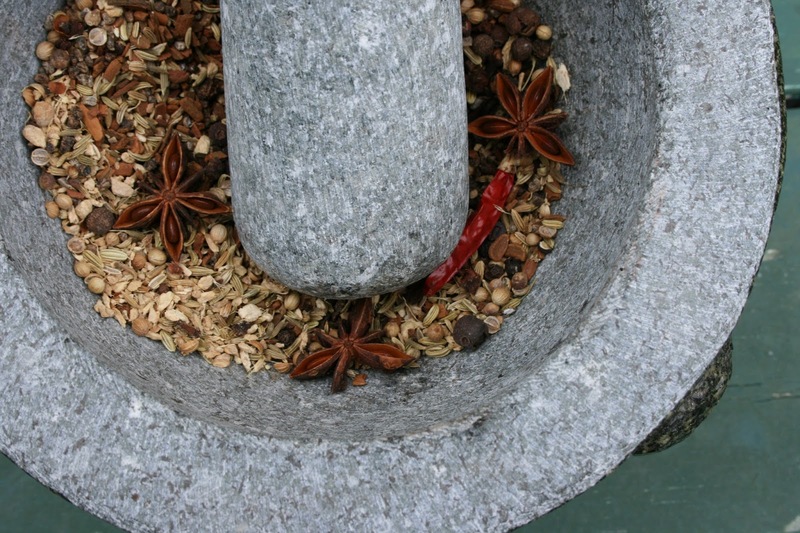 Grind whole spices together in a mortar and pestle (or an electric coffee grinder if you have one) until quite finely powdered. Blend in the ground turmeric and a pinch of sea salt. Stir into 2 cups of honey. The finished electuary should be rich, dark and nearly paste-like in consistency. Store in a clean jar and cap tightly. I am witness to many moments of simple beauty, living and working here on this early 19th century farm. Often, the moments are fleeting and I am the only one to see. I'd love to share a few words or images here as they move me through the seasons. When you have a moment, please stop by the website to check out the Farm at Coventry herbal products line, the 'Homestead Herbalism' 12 month course curriculum and monthly 'Herbal Hands' workshop schedule. All photographs are the personal property of Susan Hess and cannot be reproduced, in any manner, without written consent . All rights reserved.